Subtitle: Obadiah 15-18 foretells the annihilation by fire of an entire nation, the House of Esau, which are the Palestinians led by Yassir Arafat. 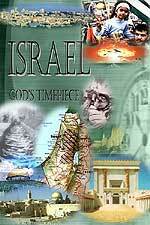 Israel possesses the "Weapon of Fire" that could fulfill this prophecy precisely! HOWEVER, THE MOST CALAMITOUS EVENTS IN WORLD HISTORY ARE ABOUT TO BREAK OVER OUR HEADS, AND PEOPLE WILL BE DEMANDING ANSWERS. THE TRUTH IS THAT A JUDGING GOD IS CARRYING OUT HIS JUDGMENTS EXACTLY AS HE FORETOLD 2,500 YEARS AGO. MAY PEOPLE SEE THIS PROPHECY FULFILLMENT AND TURN TO JESUS CHRIST FOR SALVATION! PROPHECY BRIEF: Obadiah 15-18 -- Set in End Times because verse 15 begins with the prophetic words, "For the Day of the Lord ...". God consistently uses these words to denote End of the Age prophecies, and this time is no exception. Let us review this prophecy in some detail, so that our later discussion will have a framework in which to occur. [Quotes below taken from Parallel Bible, KJV/Amplified Bible Commentary, quoting from the Amplified side]. The remaining three verses [19-21] tell in great detail how completely Israel will expand out to possess the land God had promised to Israel. This land includes Lebanon, part of Syria, two-thirds of Jordan [Moab and Edom provinces], and the Negev Desert. When Israel expands her borders following this war with the Palestinians, Egyptians, Syrians, and Jordanians, she will not only win, but will send her armed forces out to occupy all the land God had promised them. But, God will also bring about the purification of Mount Zion through this war. Notice in verse 17, God says: "But on Mount Zion [in Jerusalem] there shall be deliverance [for those who escape], and it shall be holy." The only way that Mount Zion [the Temple Mount] could be made holy in God's sight is for the Muslim Dome of the Rock to be removed! Now, that is a very interesting concept, because the New World Order Plan to produce Antichrist calls for just such a destruction of the Dome of the Rock [Read NEWS1404, "Arafat's Blunder On CNN May Have Revealed An Arab Plot To Ignite The Middle East Conflagration By Bombing Their Own Holy Places" for full details]. Antichrist will receive the recognition of being the Jewish Messiah as he is standing "amid the rubble of the Dome of the Rock ! Most interestingly, our search amongst the propaganda of the Palestinians and Hamas [the terrorist organization supporting Arafat], turned up an unbelievable fact: Palestianian propagandists are already preparing their people for the blowing up of the Dome of the Rock! Time and time again, militant Palestinian organizations have warned that Israel is planning to blow up their beloved Al Aqsa (Dome of the Rock). Therefore, the deed is not only prophesied in Obadiah, but it is now verified twice from Palestinian sources -- Arafat on CNN on September 7, 2000, and now by Palestinian propagandists. Arafat will likely be God's human agent by which God will fulfill His prophecy in Obadiah 17, that "On Mount Zion there shall be deliverance ... and it shall be holy ". Arafat does not realize he is going to purge Mount Zion of the pagan Dome so as to make it holy; he thinks he is doing it because such an act would instantly unite all one billion Muslims in the world into such a frenzy that Israel cannot possibly survive the ensuing, furious onslaught. Since he does not believe Bible prophecy, Arafat does not know he is fighting Almighty God, and will, himself, be annihilated, along with all his Muslim allies. God foretells this kind of slaughter in Zechariah 12:2-9, in order that, at the end of the 7-year Tribulation Period, Jesus can return to a Christian Israel as foretold in verse 10b. This prophecy states that the nation of Israel [the combined houses of Jacob and Joseph] shall have some kind of a fire build up within them that will suddenly explode outward to consume the House of Esau in 100% annihilation. Since a weapon of fire does not travel outward from its source too far, we can assume that this House of Esau must be living in close proximity to Israel at the moment of this conflagration. But, the major question is, "who is the House of Esau today"? A number of years ago, I emailed the Israeli Embassy to ask who the modern-day descendents were of the House of Esau, if indeed there were any. A couple days later, I received an email back from a rabbi, who told me that the Palestinians were the modern-day descendents of the House of Esau! These Palestinians lived in both Edom, a province of Jordan, and within Israel under the leadership of Yassir Arafat! This prophecy means that the Palestinians are going to "burn like stubble", are going to be "consumed" and "kindled", by a weapon of fire exploding out of Israel. This is the prophecy, and it means what it says! Now that I had the proper understanding as to what this prophecy meant in this time period in which it will finally occur, I had several questions, which I will list and then go back to discuss each of them. 1. What kind of weapon could Israel possibly possess which would annihilate 100% of a population, and do so with fire? 2. If God's judgment of 100% annihilation is to be carried out by Israel -- as Obadiah 18 states -- what kind of action would be necessary to carry out such a population genocide, while protecting Jewish citizens? 3. What might be the final event that would signal that this genocide is about to begin? Now, that we have gotten the relevant questions on the table, let us examine them in more detail. 1. What kind of weapon could Israel possibly possess which would annihilate 100% of a population, and do so with fire ? At first, I thought of the Neutron Bomb, which Israel has admitted it possesses. This weapon would annihilate 100% of a human population, as it is designed to kill all mammals by bombarding their bodies with neutron particles, so that they would instantly die. However, this weapon does not kill by fire, although you might argue that the initial blast that ignites this weapon does emit some fire. However, the killing is not accomplished by fire, and the reading of this passage in Obadiah seems to imply that the death blow is dealt by fire. Further, no one can control the "over-spray" effect of the exploding Neutron Bomb so that it does not kill your own citizens. This factor is exceedingly important when you are dealing with the heavy concentrations of populations within the tiny nation of Israel. Further, Jewish and Palestinian towns and cities are geographically located very close to one another. "Over-spray" seems to rule out the neutron bomb. We believe that Israel possesses Plasma Beam, or Particle Beam, weapons. Jerry Smith, New Age author who has written "HAARP: The Ultimate Weapon of the Conspiracy", confirmed to me in an email in 1998 that a Particle Beam weapon could, indeed, achieve a quick 100% annihilation of a population. Jerry said that America tested such a weapon in the Gulf War, which is one of the reasons we killed so many Iraqis while losing very few men. Today, such weaponry could be mounted on large trucks, helicopters, aircraft of all kinds, and possibly even tanks. However, the Particle Beam does not kill with fire. Traditional nuclear weaponry would kill entire populations, and would do so with "fire"; however, no one could control the "over-spray" that would wipe out Jewish citizens as well. This fact seems to preclude the use of atomic weaponry on the Palestinian population; we believe Israel will use atomic and neutron weaponry against invading armies from Syria, Egypt, and Jordan. But, she cannot use it to kill the Palestinians because it is not surgical enough. The United States and Israel do possess a "Fire" weapon of mass destruction, and we believe this is the weapon Israel may use to achieve God's pronouncement of the doom of His judgment as described in Obadiah 15-18. This weapon is called the "Fuel-Air" bomb, and it was devastatingly used during the Gulf War. In fact, one of the most vivid pictures taken of that war depict a miles-long column of Iraqi vehicles that was totally annihilated, and blackened, by the Fuel-Air bomb. Every person in every vehicle was not only killed, their bodies were charred and blackened beyond belief. News reports said that over 1,500 Iraqi tanks, armored vehicles, jeeps, ambulances, trucks, and automobiles were annihilated by these Fuel-Air bombs. The soldiers operating these vehicles were totally annihilated in seconds, and their bodies were charred and blackened beyond belief. A Fuel-Air bomb operates very simply. "Fuel-air explosives form highly gaseous mixtures which, when detonated, produce much more blast than fire. For their size and weight, they provide a much larger blast than any other weapon except for nuclear devices; in fact, the blast can mimic a small nuclear explosion ... Some are launched from aircraft, others from helicopters or ground vehicles." Thus, if the goal is to annihilate an entire city within minutes, the Fuel-Air bomb would be the perfect weapon to employ. It can be launched from aircraft, helicopters, or even ground vehicles, as the above quote tells us. Thus, Israel could deliver this Fuel-Air bomb from a variety of launching platforms, thus making it more likely they could cover all the target sites at once. Palestinian cities would explode as if they were hit with small nuclear devices, but they would largely be destroyed by blast and fire, instantaneously. Let us now go back to this article for more information. "... the appropriately named MAD FAE (mass air delivery fuel- air explosive) consists of 12 containers of ethylene oxide or propylene oxide trailed behind utility helicopters. The containers release a cloud of highly volatile vapors which, when mixed with air and detonated, can cover an area over 1,000 feet long with blast pressures five times that of TNT. A surface unit consists of an armored vehicle with 30 launch tubes for five-inch Zuni rockets equipped with fuel-air munitions to detonate mine fields. U.S. inventories also include an airdropped unit of three 100-pound canisters filled with ethylene oxide. A proximity fuse bursts the canisters 30 feet above ground and disperses an aerosol cloud more than 2,500 cubic yards in volume which is detonated a few inches above ground by a second charge. The blast overpressures of 300 pounds per square inch will flatten everything within a 60-foot radius and kill any troops nearby, both above and below ground. Just a few pounds overpressure is lethal for humans. One "favorite of the Marine Corps" in the Mideast, according to an anonymous Pentagon spokesman, was the BLU-82, known as 'Big Blue 82' or 'Daisy Cutter'. Last used in Vietnam by U.S. Special Forces for clearing helicopter landing sites, the 15,000-pound bomb is filled with an aqueous mixture of ammonium nitrate, aluminum powder, and polystyrene soap. It can only be launched from a cargo aircraft, the MC-130 Hercules, by rolling it out the rear cargo door. The bomb descends by parachute and detonates just above ground, producing blast overpressures of 1,000 pounds per square inch and disintegrating everything within hundreds of yards. It can be used to clear minefields or against concentrations of troops, aircraft, and equipment." You can see an illustration as to how this Fuel-Air bomb can destroy by blast and fire. This depiction is from a U.S. Navy website, and demonstrates 1976 technology. Thus, you can easily see how these weapons could be used to wipe out entire villages and cities of Palestinians. We wish to reiterate that we take no satisfaction from this unbelievable prophecy of carnage, but a whole lot of people are going to be searching for valid answers in a hurry once this carnage does occur. They have to look no further for correct answers than this prophecy in Obadiah. I will never forget my shock in June, 1990, when I bought a Jewish Press paper from a stand in downtown Boston, Massachusetts, for it contained an editorial that piqued my interest like none other had in a long, long time. This editorial stated that the top Israeli leadership -- both political and military -- had concluded that, in the next war between Israel and the Arabs, they had to annihilate entire populations of Arabs. This editorial explained that Israeli leadership was sick and tired of constantly being attacked by the Arab, and to discover that the Jewish military victory did not result in a permanent peace, but only set the stage for the next war. Arab states were certain to get control of weapons of mass destruction sooner or later, and use them to destroy Israel, even if they suffered enormous losses themselves [When Arabs outnumber Jews in this region by 270 million to 6 million, they can afford to take the view that enormous losses were acceptable if Israel was destroyed]. Therefore, this editorial concluded that the next war had to result in the complete annihilation of their most implacable foe, identified as the Palestinians, Syrians, and Egyptians. Not two years later, the world was introduced to the Oslo Peace Process. Can this annihilation decision be related to the Oslo Peace Process? Such a conclusion would seem to contradictory on the surface, but underneath, you can see the diabolic genius of the Illuminist-American-Israeli-conceived Oslo Peace Process. Oslo Peace Accords literally stated that Israel had come to the conclusion that, if they gave parcels of land to the Palestinians, peace and harmonious co-existence between the two peoples could at last be achieved. This belief became known as "Land For Peace", and despite warnings from prominent politicians and military men, this series of concessions began unfolding. On September 13, 1993, President Clinton held a very high-profile signing ceremony at the White House where Israeli Prime Minister Yitzhak Rabin and Palestinian President, Yassir Arafat, signed the agreement and shook hands. The world seemed poised either on the brink of war or peace, but most people wanted to believe the brink was peace. Since Israel is such a small nation -- smaller than the state of New Jersey -- it could ill afford to give an implacable enemy reserves of territory within its borders. President Nixon once described this idea as being akin to a man holding a razor-sharp knife within inches of another man's heart. However, Rabin was a retired Army general, so surely he could recognize such dangers. Since no one has ever accused Rabin of being crazy, he must have known something about the Oslo Peace Accords that we do not know. Further, Arafat refused to abide by the very agreements he had signed. In full violation of the accords, Arafat began to build his Palestinian "Police Force" into a heavily armed infantry brigade, and began to train them in military strategy and maneuvers. The Israeli government could see all this preparation occurring and did nothing to prevent it. Israeli military knew of the weapons being smuggled in, and did nothing to prevent it. A few days ago, our local paper carried a picture of Arabs marching in a funeral procession, and one of the Arabs was boldly holding up to the photographer an anti-tank weapon, specifically forbidden in the Oslo "Peace" Accords. What is going on? Has Israel lost the will to live? Are they committing suicide in mass numbers? I think not, especially when I read prophecy where God guaranteed that, when He brought Israel back to her land at the End of the Age, He would personally guarantee they would never be thrown out again [Amos 9:14-15]. So, what is going on here? I believe the Oslo Peace Accord was the specific outworking of the Israeli decision to annihilate the Arabs during the next Arab-Israeli war, a position explained by that editorial in the June, 1990, edition of the Jewish Press. You see, the Oslo Peace Accord is an ingenious trap for the Arab, they are about to fall into it, and be annihilated. Now, ask yourself what one geographical reality would a military commander wish to face if he knew he would soon be called upon to totally annihilate a civilian population, especially when such population is in very close physical proximity to your own citizens? Why, you would want that targeted population to be physically separated from your own population, would you not? The Palestinians have naturally congregated together within Israel, and the Jews have largely congregated within their own towns and villages. The Oslo Peace Accords must be written in such a way as to further encourage the Arabs to live together, and to encourage the Jews to leave such Arab neighborhoods. When Hebron was turned over to the Palestinian Authority, the local paper said that 40,000 Arabs lived there, compared to only a few hundred Jews. This is the kind of population density that a military commander would want to have before he began to annihilate a target population. In fact, a military commander would want to pull 100% of his own people out of the targeted areas just before he began his annihilating action. From my experience in U.S. Military Intelligence, I can tell you that an analyst would be looking for just this kind of action to occur, thinking that, when minority citizens are pulled out of the targeted cities and towns, this action would be a signal that large-scale attack was imminent. Thus, it was with severe trepidation when I read that Barak and his Cabinet had ordered the Israeli Defense Force to be finished with their preparations for "physical separation" between Arab and Jew by November 15, the very date Arafat is supposedly going to announce Palestinian Statehood. If this "physical separation" involves the forcible removal of minority Jewish citizens from majority Arab villages and cities, you can be fairly sure that the annihilating war of Obadiah 15-18 is about to commence. Let us examine these two maps of Israel so you can easily see how the Palestinians have been set up for physical annihilation. In 1947, the Arab portion [shown as dark] ran contiguously down the center of Israel from North to South, and in the Gaza Strip. One of the requirements for a modern nation is that it occupy a contiguous territory. 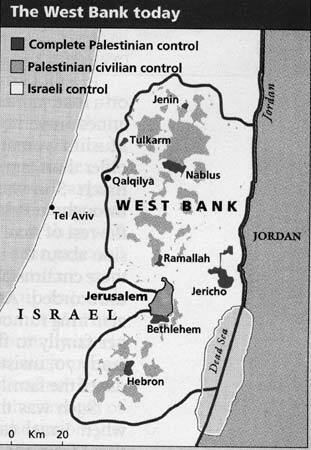 The Arabs had this contiguous territory in 1947. Now, look at the picture on the right, of the current Arab population disposition within Israel. Notice that the Arabs occupy no contiguous territory, but are clustered in enclaves, large and small. This type of clustering of population is precisely what a military commander would wish to see before he launches his war of annihilation! Oslo is a very clever trap, encouraging the Palestinians to further concentrate in clusters, in enclaves, and to discourage Jewish citizens from living within the Arab sea. Israeli leaders further knew that the Arab hatred of the Jew is so intense that it would be impossible for minority Jewish citizens to live within the enclave, as they would be harassed, persecuted, and forced to leave. Can you see how easily a military commander armed with sophisticated Fuel-Air bombs could annihilate every Palestinian living within these enclaves? The key to watch is the "physical separation" the IDF was ordered to carry out before November 15, 2000. If this separation includes the forcible evacuation of Jewish citizens living within the Arab enclave, you can know this prophesied annihilation is about to begin. Thus, we have just answered our Question #3. If this annihilation of the Palestinians were to be carried out using Fuel-Air weaponry, a most practical, but important, physical consideration would be solved. Since the Palestinians number 3,000,000 within Israel, Israeli political and military leaders have to deal with the enormous problem of burial before disease sets in. Disease started by decaying corpses that have not been buried could easily spread to the Jewish population. If the killing were done with Neutron or Particle Beam weaponry, the bodies of the victims would simply fall dead to the ground, and the normal decaying process would immediately begin its deadly course. However, if the annihilation were carried out by Fuel-Air weaponry, the bodies of the victims would be severely charred and burned, thus delaying the onset of decay, giving Jewish authorities more time to bury the dead. Thus, we are fairly certain that Fuel-Air weaponry will be used to fully fulfill the End Times' prophecy of Obadiah 15-18. The world is about to witness the beginning of the judgments of the House of Esau [Palestinians], just as God foretold in Obadiah 15-18. This annihilating war will spread quickly as Syria, Jordan, and Egypt will immediately launch all-out military strikes against Israel, trying to destroy her from within and from without. However, God will not allow Israel to be defeated; He will allow her to suffer her worst losses yet, but will not allow her to be destroyed. If Israel is defeated and destroyed, the Holy Bible will be proven a fake and a liar, and you will be free to figure out what other religion in which to believe. God's Name and Reputation are literally on the line, so you can bet all you own that Israel will emerge victorious, stronger, and will expand to "possess her former possessions" [Obadiah 17b]. Korean War in which North Korea attacks South Korea with weapons of mass destruction. As American forces are rushed to aid South Korea, we might see our reinforcements ambushed by North Korean theater missiles armed with nuclear warheads. When this happens, I want everyone to remember the early Clinton/Carter "solution" to North Korea's nuclear program. Former President Carter traveled to North Korea, and came back with a "promise" from the North that, sometime in the next decade, they would "consider" cutting back their nuclear program. This Clinton/Carter "solution" should become regarded as one of the most foolish is world history. The Chinese attack on Taiwan. In NEWS1282, we described how the Illuminati promised China back in 1952 that she would get Taiwan back. While American forces are committed in the Middle East, and bogged down in Korea, China will suddenly attack Taiwan. Since President Clinton allowed China to have access to whatever modern American secrets she desired, we should not be too surprised if she does not attack Taiwan with Neutron weaponry, annihilating all 22 million Taiwanese Chinese. Stock Markets will crash all over the world. Panic will reign supreme. Riots in cities will begin to occur, and the Justice Department's para-military and police forces will be unable to restore order. The President will come on TV to announce that he is suspending the Constitution, our form of government, and our liberties, until calm can be restored. Then, he will announce that he is asking the United Nations for troops to restore order and "peace". Exactly as planned, foreign troops will arrive to take up their assigned positions [Read NEWS1270 for full details]. Then, suddenly, amidst this unbelievable war, carnage, and panic, a spiritual "superman" will appear east of Jerusalem, riding on a donkey, and claiming to be Messiah. He will be accompanied by "lying signs and wonders", as his procession goes into Jerusalem, and on to the Temple Mount. There, he will be "enthroned, and anointed with oil [as Messiah], standing amidst the rubble of the Dome of the Rock". [The Armageddon Script, p. 235]. Watch Jerusalem, for this spark is about to set off. When Arafat blows up the Dome of the Rock to blame it on the Jew, you will know that this entire scenario will immediately begin. The scenario is planned and sure; only the sequence may change. Certainly, the signs are strongly pointing to the End of the Age. Are you spiritually ready? Is your family? Are you adequately protecting your loved ones? This is the reason for this ministry, to enable you to first understand the peril facing you, and then help you develop strategies to warn and protect your loved ones. Once you have been thoroughly trained, you can also use your knowledge as a means to open the door of discussion with an unsaved person. I have been able to use it many times, and have seen people come to Jesus Christ as a result. These perilous times are also a time when we can reach many souls for Jesus Christ, making an eternal difference.